A receiver designed for receiving continuous carrier transmissions. Signal strength detection is from a tone s-meter, not audio volume. This is an updated version of a design first published by in 2004, but now using all SMT components. 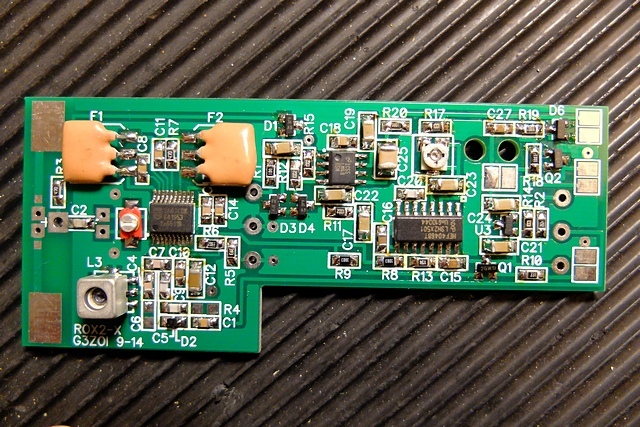 The receiver uses an audio s-meter (squeaker) ,where an audio tone is generated from the RSSI output from the SA636 IC. The pitch of the tone varies with the strength of the carrier wave of the hidden transmitter. This is the primary means of detecting the direction of the hidden transmitter. The volume of the squeaker output is fixed, pre-set by the user by adjusting an internal trimmer. The RSSI also demodulates AM modulation (i.e. the CW ident sent by the transmitters) but changes to the volume of received AM modulation will be suppressed by the limiting amplifiers used in the SA636 IC. The ROX-2 will only operate like a conventional AM ARDF receiver when detecting weak signals. A positive result of this limiting is that it provides some protection against excessive volume and ear damage. It should be noted that this receiver is designed to work best with continuous carrier transmissions. Whilst all UK and many EU events use this mode, international championship events often use keyed carrier transmissions. 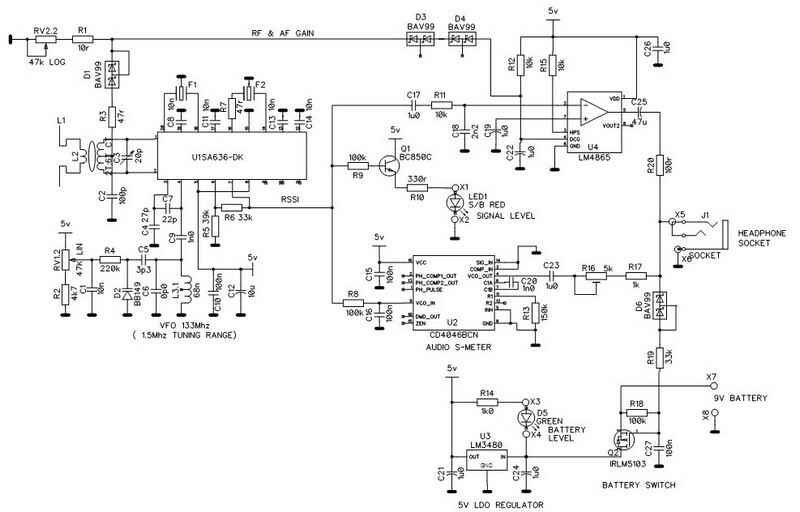 The audio is amplified by an LM4865 ‘boomer’. This IC has a digital volume control, enabling tracking with RF gain, using one control knob. As the gain control is turned anti-clockwise the audio volume decreases first, followed by the RF gain. 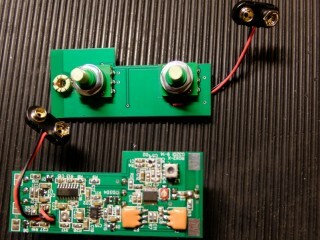 With reduced RF gain the receiver should work to within 5m of the transmitter, without saturating. 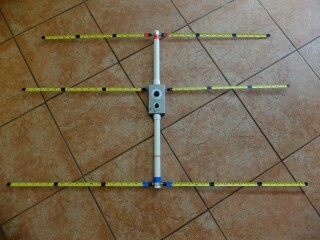 ROX2 combined with ‘Russian’ 3 element Yagi. 9-10-2014: Correction to pot. marking. Omeg LOGarithmic gain pot. marked 47KB, (nearest the toroid). LINear tune pot marked 47KA. n.b. other manufactures’ markings may differ. I in interested in the new ARDF receiver. Up to now I use a Chinese one, but I am not completly satisfied. Can I obtain one PCB? Hi Jan, I am waiting for new stock to arrive in 2 weeks time.